Welcome to DIY December! All month long, I will be featuring a variety of holiday crafts, projects, tutorials, and ideas in addition to my regular posts. Today happens to be the first day of Hanukkah, so I'm kicking off DIY December by featuring 10 great DIY Hanukkah projects. First up are some beautiful blue and silver Hanukkah tablescapes. I love the elegant look of these festive table settings. The first silver table setting features a menorah type candle holder display and pretty glittery silver stars. 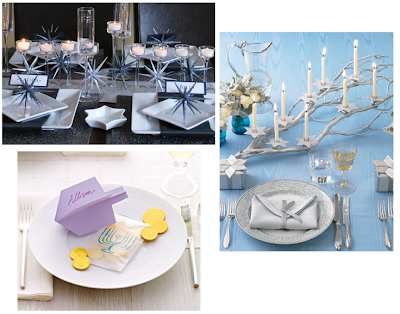 The next look is equally gorgeous with a beautiful menorah crafted from a silver spray painted tree branch. The last look is easy to replicate with DIY printable dreidel place cards. 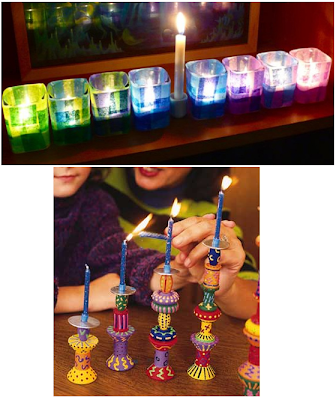 For some more great menorah ideas, check out the DIY menorah made from multicolored glass votives or the very cute menorah made from brightly painted wood spools. Wreaths are so welcoming and I don't think they should be limited to Christmas. I love these beautiful blue and white wreaths that can be displayed for Hanukkah or even all winter long. 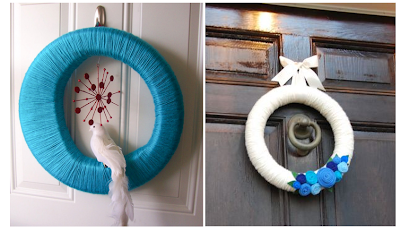 The blue wreath shown below is made from yarn and is adorned with a beautiful white dove. The white wreath is equally pretty and is also made from wool with lovely blue felt flowers. Lastly, I came across some very cool Hanukkah crafts. Instead of flowers that only last a few days, check out these DIY felt flowers that can last forever. Although most of us probably think of a large evergreen when you hear "tree" this time of year, I absolutely love this next idea of a Hanukkah tree. This "tree" is made from gold spray painted branches and is adorned with chocolate gelt and golden driedel ornaments. Lastly, check out this pretty printable paper dreidel garland. So there you have it, 10 DIY projects for the 8 days of Hanukkah! Happy Hanukkah! If you want to stay in the loop with the DIY December ideas I will be sharing this month, sign up for my RSS feed or follow me on Blogger. And if you have your own holiday do-it-yourself project or idea you'd like to share, please click on the button below and I would love to feature it!